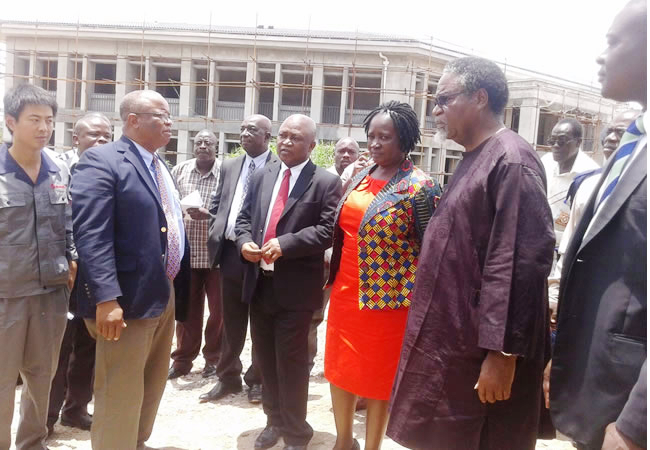 The first substantive Governing Council for the University of Health and Allied Sciences (UHAS) Ho have been inaugurated in Ho last Wednesday. The 13-member council replaces the University’s Implementation Committee, which acted as interim Council, since its establishment by an Act of Parliament (ACT 828) in 2011. The Council which has a-three-year tenure to be renewed once is under the chairmanship of Prof. Kofi Anyidoho of the University of Ghana-Legon, who was also chaired the interim council. The Minister of Education, Prof. Naana Jane Opoku-Agyeman, who inaugurated council, commended the interim Council for the “remarkable progress” made and urged the substantive Council to be guided by provisions in the University’s Act in all its deliberations. Other members on the Council are Mrs Justice Agnes Dordzie of the Court of Appeal, Togbe Tepre Hodo IV, Legal Practitioner, Prof. Ernest Aryeetey, Vice-Chancellor of University of Ghana, Dr. Yaw Adu-Gyamfi, CEO Danadams Pharmaceuticals Industries and Dr. Sodzi Sodzi-Tettey, Catholic Health Services. Others include Prof. Fred Binka, Vice-Chancellor UHAS, Mr Paul Dzandu, Deputy Executive Secretary National Council on Tertiary Education (NCTE), Mr Dzidzeme K. Sedanu-Kwawu, representative of Conference of Heads of Assisted Secondary Schools (CHASS). The rest are Mr Emmanuel Adjei, Chief ICT Officer UHAS, Mr Kwabena Sakyi, representative of the Federation of Universities Senior Staff Associations of Ghana (FUSSAG), Dr. Francis Zotor, representative of the University Teachers Association of Ghana (UTAG), and Mr Daniel Y. Sarfo, representative of the Students Representative Council (SRC). Prof. Anyidoho commended the late President John Evans Atta Mills and President John Dramani Mahama for their foresight in establishing the University. He also expressed gratitude to the university community and workers for their support towards the successful take- off of the University. Prof. Anyidoho said though young, UHAS had attracted large numbers of applicants and was optimistic things would move faster when structures at its permanent site were completed.